Some people choose to spend their Hawaiian vacation moving no further than the lounge chair by the swimming pool. Others like to get out and explore a bit and that is where a vehicle with four wheels can be pretty darned handy. If you are the exploring type and you fancy a trip to Hawaii, United Vacations has a deal that should be right up your alley. Book a flight and a hotel stay and you will have use of an Alamo rental car for five days for free. Just make sure that you don’t ruin other people’s vision of paradise while you are driving around the islands. 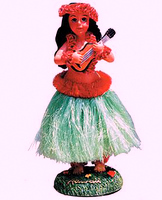 Wear your seatbelt, hang up your cell phone, keep both hands on the wheel, and by all means put one of those hula dancer dolls on the front dashboard. Save up to 30% on travel to Hawaii and receive a free 5-day car rental!